James Abbott McNeill Whistler, (1834-1903). American-born painter and graphic artist, active mainly in England. Whistler's deft brushwork and mighty ego made him one of London's best-known painters in the second half of the 1800s. 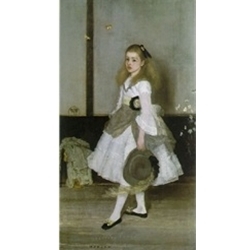 Born in Massachusetts, Whistler spent most of his adult life in England and France, in an era when an American artist in Europe was something of a rarity. He specialized in landscapes and (especially later in his career) portraits; stylistically he is often linked with Claude Monet and August Renoir, though he was not exactly part of the Impressionist movement.